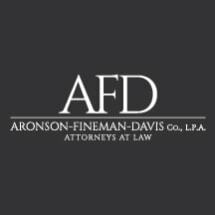 Since 1935, the attorneys at Aronson, Fineman & Davis Co., L.P.A., have been providing skilled legal counsel to our clients in East Liverpool, Ohio, Columbiana County and beyond. Led by Attorney William J. Davis, our law firm is a leader in personal injury litigation in Ohio, Pennsylvania and West Virginia. In addition to our personal injury practice, Aronson, Fineman & Davis Co., L.P.A., also serves clients throughout Columbiana County, Ohio in several areas of the law including; criminal law, family law, business law, probate law and estates. Since 1986, Mr. Davis has been continuously certified as a Civil Trial Specialist by the National Board of Trial Advocacy. The National Board of Trial Advocacy is accredited to certify lawyers as Specialists in Trial Advocacy by the American Bar Association, the Ohio State Supreme Court Commission on Lawyer Specialization and the Pennsylvania Supreme Court. The law firm’s attorneys, serving the general needs of Columbiana County clients pay the same attention to detail, thoroughness and zealous representation as they do in pursuing personal injury and wrongful death claims. His firm’s personal injury practice consists of representing seriously injured victims and prosecuting wrongful death claims. Although the majority of his practice involves car crashes, he has a reputation for taking on complex litigation involving insurance, medical claims, product liability, utility liability and all types of vehicle crashes. He regularly serves as co-counsel and consultant to other law firms in their representation of victims suffering personal injury or wrongful death damages. He has been named an Ohio Super Lawyer since 1986 and has an AV Preeminent Rating by Martindale Hubbell, the highest possible rating in legal ability and ethical standards. As a client, you benefit from Mr. Davis’s considerable experience and expertise as a litigator. In your first meeting with Mr. Davis, he will conduct a thorough interview and gather comprehensive information about you and your injuries. Then he will give you an honest assessment of your legal position, and map out for you what must be done to obtain a good recovery. Our firm operates a twin-engine aircraft,that allows our attorneys to promptly meet with personal injury victims in person, and pursue serious injury claims throughout Ohio, Pennsylvania or West Virginia. Call to discuss your case on the phone, in our office, in your home or in the hospital.